We have a small farm in east central Nebraska. We raise purebred/registered Nigerian Dwarf Goats for home Dairy. We are members of ADGA, AGS & NDGA. Show Quality --> Our herd contains bloodlines from well known showing/& or production herds from different states. We blood test our breeding stock, disease testing our herd yearly for CAE, CL, Johne's & Brucellosis. Our goat kids are CD/T vaccinated, disbudded & the bucklings are casterated --> So NO horns & NO bucky smell. Nigerian Dwarf are one of the smallest breeds of goats (small size similar to pygmy). They are a dairy breed. They are the most miniature of all the dairy goats(they're tiny in comparison). When you see them at dairy goat shows-like at the State Fair-you can see just how small they really are! They may be little but they can still be easy to milk and take up much less space and far less feed then the full sized breeds. Perfect for the homestead just wanting a few small dairy goats - 1 or 2 of these little does will give you plenty of milk for your home uses. They are the ideal milk goat and quite often can be bred year round to stagger freshenings of does for a more continuous fresh milk supply (other dairy breeds are seasonal breeders). Their mini size is perfect for even the smallest farms, and they can keep their pasture areas weed free. They are so easy to handle, have wonderful personalities/temperment- and are perfect little livestock for farm kids and those in 4H/FFA. Nigerians have the most variety of all the goat breeds - there are so many colors & patterns out there. Not to mention, some are polled(naturally hornless), some have blue eyes, some have wattles, many have beards & some with moonspots. (Pygmy's & other breeds do not come in as many colors & patterns nor have all the other possibilities.) With Nigerians its always an exciting surprise - it seems like you'll never know what you'll get till they're born! Fainting Goats: We do NOT raise fainting goats (myotonics). We once had 2 as pets and learned from them what a sad thing their condition was. They dont faint,what happens is their muscles lock up like a full body cramp. They holler in pain and struggle to get up. We decided it looked painful and cruel and not something we wanted to breed more of. They are larger than Nigerian Dwarfs too. Standard Breeds: NEVER breed any standard size buck to a nigerian doe, the doe will die from babies being too large. Only Nigerian bucks can be used on Nigerian does. Nigerian bucks can be used on standard does for mini's but never the other way around. We are near Shelby, Nebraska - pretty much centrally located in eastern Nebraska. Just a little over an hour or so drive from Grand Island, Lincoln, Fremont or Norfolk areas. KIDS - We usually have kids born starting in late winter, going throughout spring till summer, then a few in the fall. We stagger them out some because we really like being able to give all the kids lots of care and attention, that's impossible with lots of babies all at once. This also helps to ensure our dam raised babies get plenty of human interaction, making them tame/easy to work with. DWARF SIZE & TRANSPORTING - Transport kids inside vehicle in a large dog crate (adults fit a large crate also). Truck beds with wire pens are too cold/windy and stressful. Truck bed pen for adults only in decent temp/weather. Dwarf adult height is usually 17-23 inches or so - measured at the withers. Withers is the ridge between the front shoulders on their back. (Size is somewhat comparable to the size of a small lab - most often smaller). For showing the height max: Does 22.5 & Bucks 23.5. Transportation short distances can even be in a large dog crate - 2 adult does can ride in a crate approx. size of 36L x 26W x 28H (similar sized crates often fit inside vehicles - you do not need to have a truck or a trailer to transport them if you dont have either). If you have further to drive you should use 1 crate per adult. We disbud all kids that are not polled. We remove the horn buds by disbudding - so you don't need to worry about horns. We band/casterate all bucklings that are to become wethers. We use banding as method to neuter the young males - so you do not need to worry about having it done. These wethers will NOT stink like bucks do. MENTORING/ADVICE/HOW TO's/& ON-GOING SUPPORT FOR OUR CUSTOMERS - If you've never had goats or never raised them, we can help you out some by sharing our experiences either by explaining/or showing you the basics if you need (i.e. hand milking, hoof trimming, shaving for shows, tattooing, disbudding, banding, etc). You can also stay in touch and ask us anything as you go along. Care is not difficult but there are some things in breeding goats that come easier with a little knowledge. Also, there are great goat books out there and tons of information online (including videos and groups) that can all help you throughout owning &/or raising your own. A little reading/research and your good to begin. Just make sure to practice illness & disease prevention & when needs arise relating to a goats health/medical needs seek the expertise of a Veterinarian. Though few are experienced 'goat vets', a livestock Veterinarian can help. FARM RAISED & HOME GROWN - Nigerians are an actual dairy breed not a meat breed, however, some people use them as dual-purpose dairy & chevon (some use wethers for chevon). Local natural food stores now carry goat dairy products & meat. It is said that over 70% of the world's population eats goat meat. People are becoming more conscious of where their food comes from and have been opting to start growing and raising their own. The thought takes some getting use to - but fact is goat is used dual purpose all over the world - more than cattle. Goat is also getting more notice for being healthier. NUTRITIOUS SUSTAINABLE LIVING - People are planting more gardens & raising free-range chickens for eggs & meat. Well, raising dual purpose livestock is the same. You can produce lots of yor own foods with chickens & goats - Eggs and Dairy Products & Meats. Caringly farm raised is the most humane, and you will know exactly what is in your family's food. <a href="http://goattipping.com/Store/goatsbystate" target="_blank">Where to Buy Goats</a>: GoatTipping.com helps you buy and sell goats within a reasonable distance of your home. 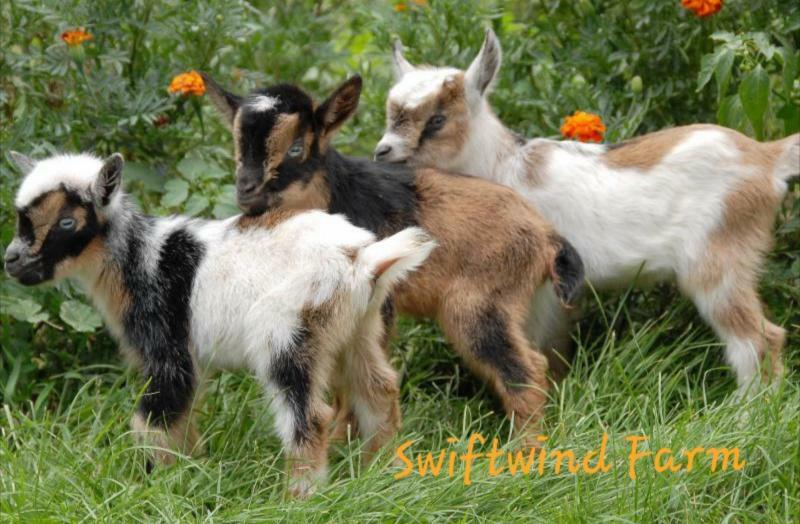 See also - Our page of Basic Cares, Additonal info about Nigerian Dwarf, Tips/Advice, Biosecurity & lots more info to help you get started in these little goats. Wethers(banded/'neutered' males) do NOT stink like bucks do. They resemble & act more like females. They are also disbudded, so NO horns. Wethers do NOT need grain. NOT feeding grain to males is a preventative to urinary calculi (stones). Nigerians produce a large amount of milk considering their tiny size. They can give you plenty - just the right amount. They should be milked 2 time daily 12 hours apart (can vary a an hour or two but keep on routine as much as possible). Some people milk 1 time daily, it works fine but you get a little less milk. Nigerians can be bred nearly year round - supplying you with fresh milk more often than all the seasonal breeds. Our milking does are milk stand trained. ﻿We 'hand milk' all our does after they wean their kids. Does that are 'for sale after kidding' - and are being sold 'in milk' will go through milk stand training for at least a week or two before leaving. If you are buying a doe 'in milk' & you've never milked before, we will gladly show you how to milk her by hand. When you are purchasing a senior, adult, or 8mth+ doe from us (that is not currently in milk) - you can have her be bred to a *buck before you get her if you'd like, just request this ($100 deposit due before breeding) *Note: buck selection is limited to those we choose to offer for free servicing of a doe prior to pickup -Inquire on which bucks are currently available for this - we usually offer 2 or more bucks to choose from. Does that have recently kidded and are in milk are not available to be bred before leaving. Disease Tested - We test our adults yearly for CAE, CL, Johne's & Brucellosis. Our vet & the vet's assistant come out to the farm to pull blood for our annual disease testing. It is quite the event to draw blood from a herd this size, 5 of us get a work out but have quite a system down. (We pull the blood ourselves when doing pregnancy tests.) We recommend that you buy your breeding stock from tested herds to avoid bringing disease to your herd/farm. Some diseases stay on your property for years & years. We encourage other breeders to blood test their herd for diseases. We will occasionally offer a 'SALE Priced' adult buck from our group of herd sires, these bucks were used as sires here and therefore very nice for your herd as well. Take advantage of the discounted sale price and get a proven breeding buck. A great deal for those just getting their small herd started. (Hint: it's best to buy/transport a buck BEFORE the 'rut' begins for him and he starts getting his bucky odor - Late winter, Spring & early Summer work best.) Please don't leave your buck alone in his pen, consider a second buck or 1-2 wethers for his pen companions if you have no other bucks in with him (2 intact bucks are the best companions though). All other bucks and new bucklings - Price range usually between $300-$550+(depending on genetics/conformation/dam's mammary etc...) Bucklings must be reserved EARLY. We do not sell any kids as intact Bucks unless he is reserved to be a breeding Buck - they all will become wethers at a very early age otherwise. Reserve immediatly, or let us know what you are looking for in a buck and we can help you pick from our does' kidding schedules and decide which to be on the waiting list for to get the best possibility in producing the buck you desire - when that buckling is born and you decide on him, a nonrefundable deposit of $100 is required to hold him for you as a buck. Bucks must be paid for in full by 8 wks of age or forfit deposit. We do this so the kid can become a wether before its too late and he becomes a stinky unwanted Buck. (Not all bucklings born are 'future herdsire prospects', therefore, we reserve the right to decide if a buckling will remain intact to carry our herd name & genetics.) *Consider a proven herd sire first - look at our for sale page to see if any are available. Disbudded so NO horns. Stud Service - LIMITED: Sorry - servicing is ONLY available for does bought off our farm, directly by you-the original purchaser. ONLY 1-2 of our bucks may be available for stud service- for those not wanting a pungent buck on their premises. ﻿These service bucks are limited to those we are not using & that are housed seperate from all our other goats due to being used for does that have been off our farmstead. Our adult herd is blood tested yearly, our service bucks will also be tested one or more times a year. We know more & more people are interested in having 1-2 does for milk, but some just don't need a buck but for a day every year or so. Your doe will need to be in standing heat - we do NOT board, (we only do 'driveway' style service breedings). Servicing is only available for does bought off our farm, directly by you - the original purchaser. Keeping a wether in your doe pen will serve as a GREAT 'Heat Detector' and let you know when to bring the doe to be bred. A wether works wonderfully to tell you when the time is right-you should bring her that day/evening to be bred. You can also learn to see the 'signs' yourself, but a wether is the best. Inquire on available service bucks and fee. We do NOT lease out any of our bucks to go to other farms for a breeding season. If you are looking for a small starter herd / package deal -or just want a tiny herd for milk and if you want your own buck to bred your does (to 'freshen' milk does when needed)- start with a breeding trio. Purchase 2 or more of our does and get $100OFF a buck/buckling (discount only applies when does and buck are purchased & picked up at the same time).